Ever since the nail art craze on Instagram and Pinterest, we’re all prone to post pictures of our fresh manicures in the hopes that we’ll earn likes and comments aplenty. Even if you’ve got the hottest color polish with the most interesting new technique in nails, nothing ruins your social media snapshot like dry, jagged cuticles. Up close pictures of your digits means it’s hard to hide a bad cuticle situation, which means you need a solution like a good oil treatment. In an effort to clean up the nail bed situation and attain more likes, we searched around for a cheap solution and found Sally Hansen Nail Treatment Vitamin E Nail & Cuticle Oil. Besides moisturizing nails and cuticles, this oil strengthens your nails and doesn’t break the bank. Costing less than $6, it starts working to repair your nails and make your at-home manicure look like you spent an hour in the salon. 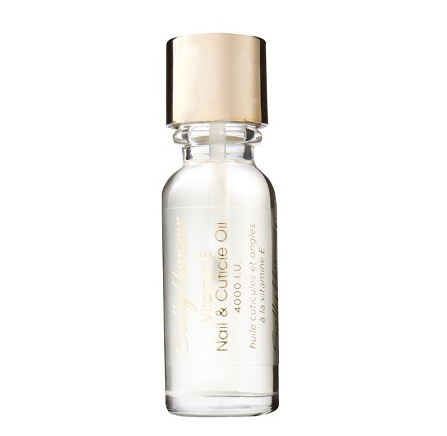 After continually using this oil, your manicure will last longer and your close-up shots will look professional.